From classic cobalt to dreamy turquoise to rich royal blue, nothing refreshes a dull kitchen like a livable hue. Strong, subtle, cool, or moody, blue brings life to any kitchen element, from cabinets and walls to trimwork and accents. 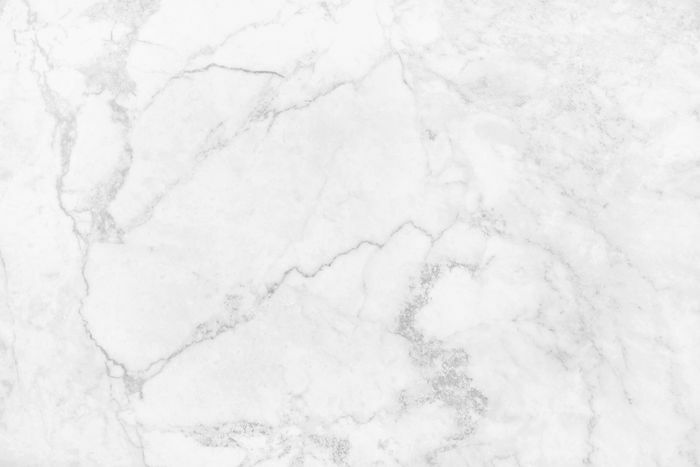 There's no doubt that subway tile is truly timeless. That's why you'll love this royal-blue backsplash installed by Howells Architecture + Design. The vibrant tile breaks up the white space, giving the otherwise neutral-tone kitchen extra dimension. Limiting your color palette could be the chicest way to make an elegant statement in a living space. This custom-built kitchen by Københavns Møbelsnedkeri makes the most of a fresh shade from Pantone called Serenity. Ocean views inspired the palette for this sunny, seaside kitchen designed by Elizabeth Swartz Interiors. Besides the ceiling beams and breakfast bar, everything is a cool shade of blue, from the Shaker cabinets and stone countertop to the glass backsplash and pendant lighting. The result is a lovely cooking space that feels extra inviting. Torn between blue and green? The color teal is a mixture of both. As shown in the delicious kitchen by Devol Kitchens, it's a sophisticated shade that will give you the best of two hues. See the wall to ceiling cabinets on the right? They conceal a full-size fridge and double pantry. Go for drama in a sun-drenched kitchen by pairing rich navy walls and matching cabinetry with glossy white subway tile. For a kick of glitzy personality, use a mix of metallic features. This cooking space by Bureau de Change is equipped with a matte brass faucet and chrome plated pot filler. Love the color of faded denim? This rustic, modern kitchen by Holmes Hole Builders uses the welcoming shade of blue to enhance the beauty of the reclaimed wood walls. Sensible, concrete countertops give the cooking space a pinch of urban edge. You don't need expensive appliances, pricey cabinetry, or a costly stone countertop to create a functional kitchen that's also incredibly charming. Freshly painted cabinets and walls set off a colorful tile backsplash in this turquoise kitchen by Chad McPhail Design. If you have a sun-drenched kitchen like this bespoke cooking space designed by Devol Kitchens, consider painting your walls and cabinets midnight blue. The color is way more stylish than black and makes both wood and metal accents pop. A bold shade of blue imparts a soothing tone in the sun-filled heart of this home by architect Meriwether Felt. 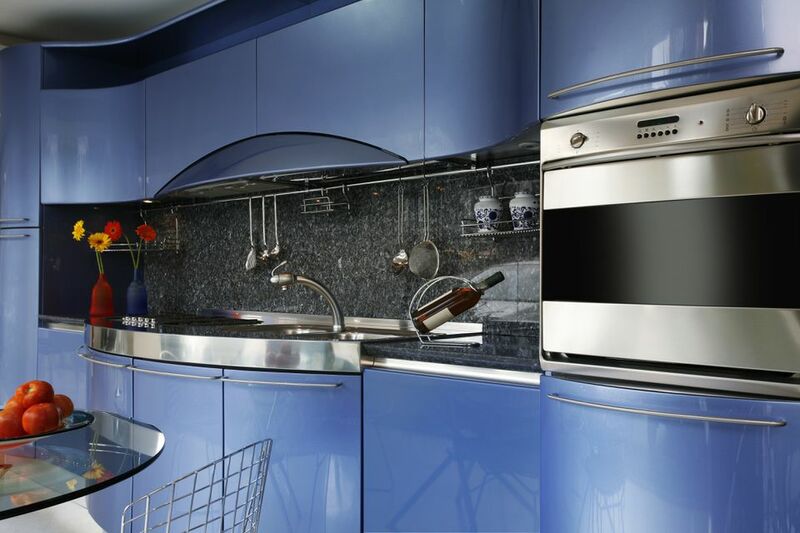 The milky white walls beautifully show off the cobalt cabinetry. The refrigerator seemingly disappears in this cooking space, thanks to custom panels designed to match the cabinets. This sky blue kitchen by Dear Designer is like a breath of fresh air. If you hunger for a little texture in your cooking space, notice the beadboard cabinets. For a touch of rustic flair, consider wood countertops. Don't want to overwhelm your kitchen with color? Consider a pale shade. Icy blue cabinets give the cooking space in this Swedish apartment sold by Lagerlings a fresh and modern twist. For a few tiny bursts of additional color, add several houseplants. Make your metal accents shine with a chic shade of blue. This Brooklyn kitchen designed by White Arrow Studio combines an indigo wall and coordinating cabinetry with stylish copper fixtures and crisp white walls. What's the hottest kitchen decorating trend? Modern farmhouse. It puts a clutter-free spin on country cottage style by mixing a high-contrast neutral palette with vintage-inspired pieces and warm industrial designs. This navy and cream kitchen built by British Standard Cupboards is a pitch-perfect example. Who knew copper water pipes could be a stylish kitchen feature? If you crave a soft hue that's anything but timid, satisfy your hunger with Caribbean blue. It's the beachy shade that brightens this cute kitchen by Sarah Blank Design Studio. The refreshing color works beautifully with chrome hardware and stainless steel appliances. Create a cozy kitchen like this one featured at the Oslo Design Fair by painting your walls and cabinets a subdued shade of blue. Natural wood shelving brings a calming bohemian twist. To shake things up, add a few mismatched chairs in room-brightening colors like pink and red. A pale, minty-fresh blue makes a huge impact in this tiny kitchen featured on Fantastic Frank. Ornate brass fixtures and flashy hardware can quickly feel fussy in a small space, so stick with minimally designed pieces for a dash of understated elegance. This art deco-inspired kitchen by Emily Henderson turns up the heat on glamorous function. The star of the show is the graphic floor tile that's both striking and timeless. The cabinets were painted a matching shade of bluish gray. Stunning gold fixtures and shiny brass hardware turn up the wow factor. This sophisticated kitchen by Addison's Wonderland punctuates pale blue cabinetry with vintage-inspired black and gold features, including a gorgeous range hood. On the right is a midnight blue tile wall that makes the cooking space feel huge by raising the eye upward. But perhaps the best touch is the turquoise bead chandelier over the breakfast nook that adds a pinch of bohemian spice. 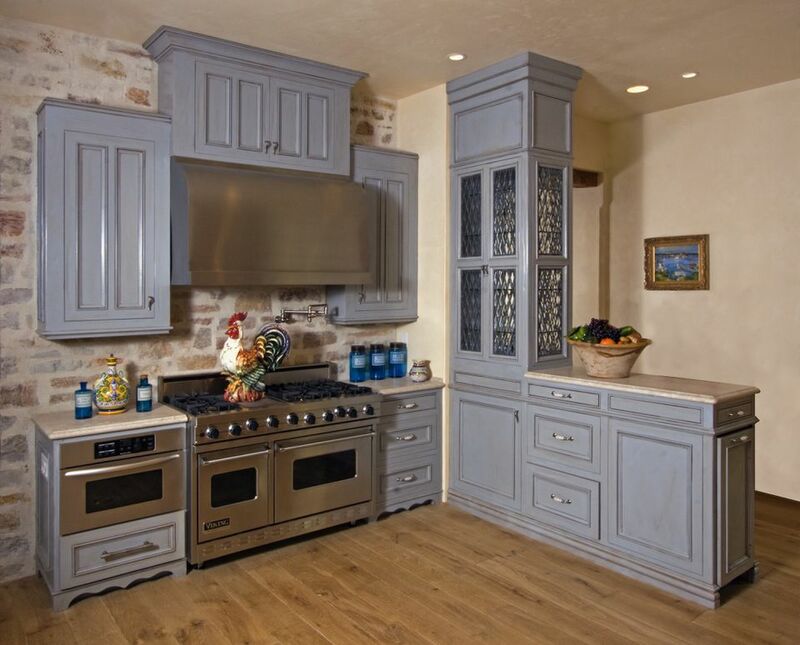 Blue paint flaunts the wood grain on these cabinets in this lovely open kitchen by Ivan House Design 404. The contrasting woods and pops of black, green, and white add visual interest. This cheerful blue kitchen by British Standard Cupboards is oozing with retro charm. Eye-popping features like the graphic floor tile and red Smeg Fridge give the cooking space a playful, modern vibe. Who says a high-traffic kitchen like this one by Joel Kelly can't be both glamorous and functional? Here, blue wood stain puts an unapologetically luxe spin on the floor-to-ceiling cabinetry. The blue-gray backsplash over the stove provides a pretty graphic element. A sky blue backsplash turns up the contrast in this modern kitchen designed by Griffin Enright Architects. The look is achieved with a brightly painted wall covered with impact-resistant glass and then set off with dark cabinetry. Quirky, cozy, and cool best describes this two-tone blue kitchen spotted on Entrance Makleri. The wall colors unify the space that's divided into separate areas by natural wood elements and black features. Shades of blue reign supreme in this fresh and vibrant kitchen designed by Michelle Gage. Sea blue walls and a bold fish scale backsplash turn an otherwise boring white kitchen into a delightful, ocean-inspired cooking space. Beautifully designed hotel rooms often ignite exciting new decorating trends. For instance, a bold blue color makes a big statement in this tiny hotel room kitchen designed by Jersey Ice Cream Company. Polished brass hardware and fixtures bring the sparkle. Are you torn between colors? Kick those matchy-matchy decorating tips aside by creating a one-of-a-kind backsplash like this one by Mirth Studio. The trick is to incorporate a unique mix of colorful tile that complements your blue kitchen. Arctic white countertops with beautiful waterfall edges brighten up this ​chic blue kitchen by Studio McGee. The homey bar stools made of natural wood add texture and warmth to the dazzling cooking space. If you're going for a luxurious look, you'll heart this kitchen designed by Grant K. Gibson that combines alluring navy cabinets with a luxe marble backsplash. For extra glam, go with a gorgeous gold vent hood. This modern urban kitchen created by Spectra Design features custom bluish-gray cabinetry that blends seamlessly with the stainless steel appliances. The most eye-popping feature in this New York City cooking space is the unique honeycomb-inspired backsplash. Do You Know How to Select the Best Wall Color for Your Kitchen?